Built in 1945 and recently restored in 2002, four star Ermitage Hotel is located in an exclusive residential area of Montevideo, in front of Pocitos Beach, on beautiful Gomensoro Square. 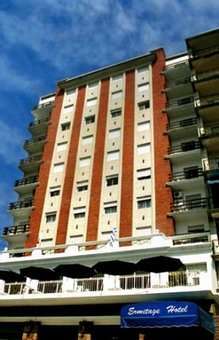 Situated in the Pocitos neighborhood with a view to the Rio de la Plata, the Ermitage is near the city's commercial center, surrounded by banks, shops, cinemas and restaurants, only five minutes from downtown Montevideo and the bus station, ten from the port, and 30 minutes by car from Carrasco International Airport. The hotel features 100 well-appointed bedrooms, including suites and apartments with private terrace with an ocean view. The Ermitage Hotel has a cafeteria where you can enjoy drinks and snacks with an outdoor area viewing the Pocitos Beach. Additional hotel amenities include: Emergency medical assistance with doctor on call, breakfast room, private parking, laundry service, cafeteria, business center, free 24 hour internet access, and audio visual facilities. Room amenities include: Cable television, internet connection, digital telephones with voice mail, work-desk, security box, central heating, air-conditioning, hair dryer, minibar and snack bar. Ermitage Hotel makes the ideal accommodation for a business trip, as well as for a pleasure visit.